People frequently ask us how to clean mold. Cleaning up mold is important because not only is mold unsightly and not only does it produce an unpleasant musty odor, but it can lead to a wide variety of health problems, some minor and some quite severe. Knowing how to remove mold safely is important because you can become very ill from inhaling mold spores, whether the spores are alive or dead. It is important to learn about cleaning up mold safely before you get started on the job. You should also know that the Environmental Protection Agency also recommends you only try cleaning up mold yourself if the mold covers only a small area. If you have mold covering more than about ten square feet, the EPA recommends calling in a professional that will know how to clean mold safely and have all the necessary safety gear and equipment. If you’re going to attempt cleaning up mold yourself, start by outfitting yourself with all the necessary safety gear. Wear disposable hair and shoe covers, rubber gloves and an N-95 face mask. You can get the face mask at many hardware stores; specifically request an N-95 model, because not all face masks will filter out all mold spores. Use a large sheet of plastic and duct tape to cover the doorways of the room in which you’ll be working so that no mold spores can drift into other areas of your home. Cover any heating vents with plastic, as well. If the room has a window, open it and position a fan in front of the window in such a way that it will direct air (and therefore airborne mold spores) out the window. If you spray moldy areas lightly with a spray bottle of water prior to starting to clean up the mold, that will help prevent mold spores from going airborne. Launder your clothing as soon as you finish cleaning up the mold, because mold spores will cling to your clothing and can easily be tracked all around your house. There are some situations in which you may be unable to clean up mold on your own. If you have any respiratory problems or problems with your immune system, you shouldn’t risk the exposure to mold and should call in a professional instead. 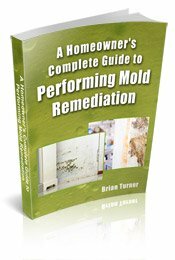 He or she will know how to clean mold safely and you won’t have to risk your health. If you have mold covering a large area or if you have mold in hard-to-reach locations, such as inside your walls or inside your heating ducts, a professional may be better suited to the job. He or she will have special equipment to handle difficult jobs and will have special training in how to do the job safely. We encourage all homeowners to schedule a consultation with a mold removal specialist, even if they plan to clean up the mold on their own. Mold removal specialists usually offer free consultations, so they will thoroughly inspect your home for mold and provide you with a recommended treatment plan, including important safety precautions, at no charge to you. Even if you decide to take care of the job yourself, you’ll benefit from some free professional advice. 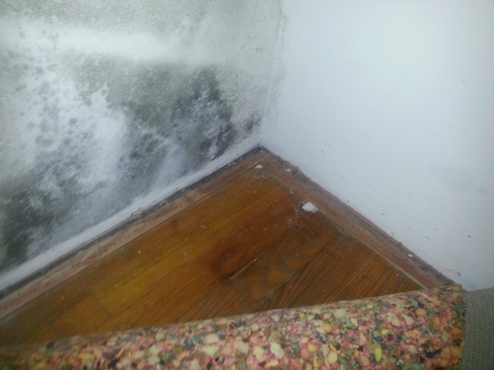 To schedule a free consultation with a mold removal specialist near you, just click this link.